Burawoy’s manifesto connects to a long series of debates on the role of science in society as well as on the myth of pure science. 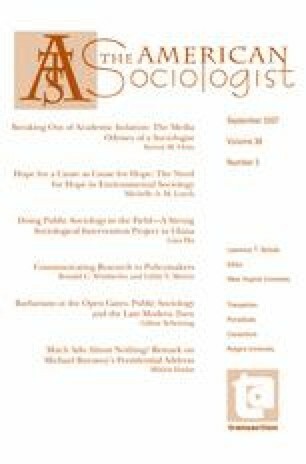 This paper argues that the gap between professional sociology and public sociology is far from being unbridgeable and that public sociology is not suppressed to the extent portrayed by Burawoy. In late modern societies a number of schools, including various scientific, public and intellectual movements have questioned the possibility, value position and social relevance of a functionally differentiated pure science by applying the sine qua non of modernity, i.e. critical reflection, to science. According to the argument developed here, also illustrated by a personal example, Burawoy could possibly prevent the gate-keepers of the empire of pure science from closing the otherwise open gates in front of his program and in front of critical reflection if only he used less harsh war-cries and were more careful in detecting the changes he himself urges. The author is grateful to Miklós Hadas (Corvinus University) who helped in publishing this essay originally prepared as an exam paper. Deflem, M. (2006). Save sociology. Last retrieved at 1 May 2007, http://www.savesociology.org. European Commission. (2007). Science and society portal. Last retrieved at 1 May 2007. http://ec.europa.eu/research/science-society/home_en.cfm. International Science Shop Network. (2007). Mission statement. Last Retrieved 1 May 2007. http://www.scienceshops.org/new%20web-content/framesets/fs-about.html.